And pretty snow too, which I am surprisingly still enjoying…but I am definitely at the point where I would not mind a long tropical vacation. But let’s be honest, the only month of the year that I wouldn’t want a tropical vacation is December, any other month of the year – I am all in! But since there is like zero chances of any tropical vacations this month, I am bringing soup to the table today. Or I guess to the blog, but I think you know what I mean. 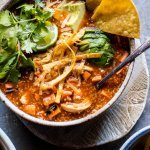 Soup is so comforting and cozy, and after a kind of rough Monday + Tuesday, I am so ready for a big bowl of this cheesy Mexican soup. Lately, I am on a HUGE Mexican soup kick. 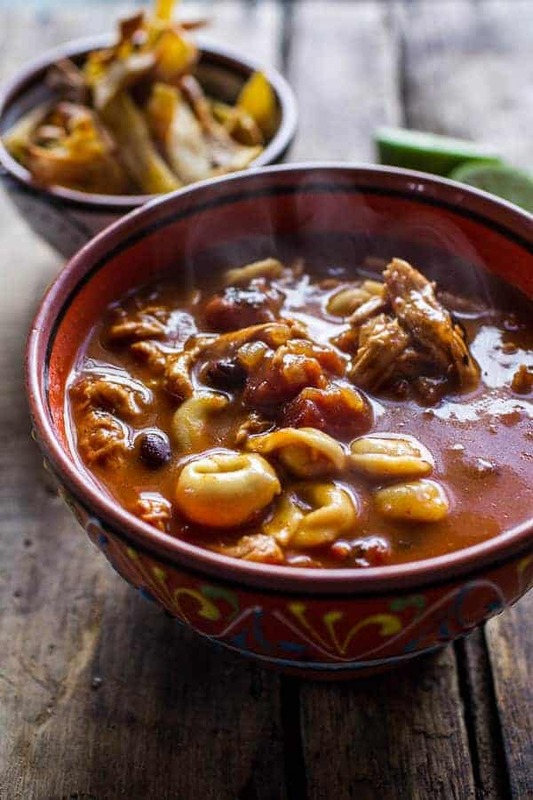 Meaning I have two other Mexican inspired soup recipes that I want to post sometime before spring and I am wondering just how to get them all in without you guys complaining that I have done one too many Mexican soup recipes. I’ll figure it out though because each recipe is too good not to share. First up, cheesy chicken tortilla tortellini soup!!! 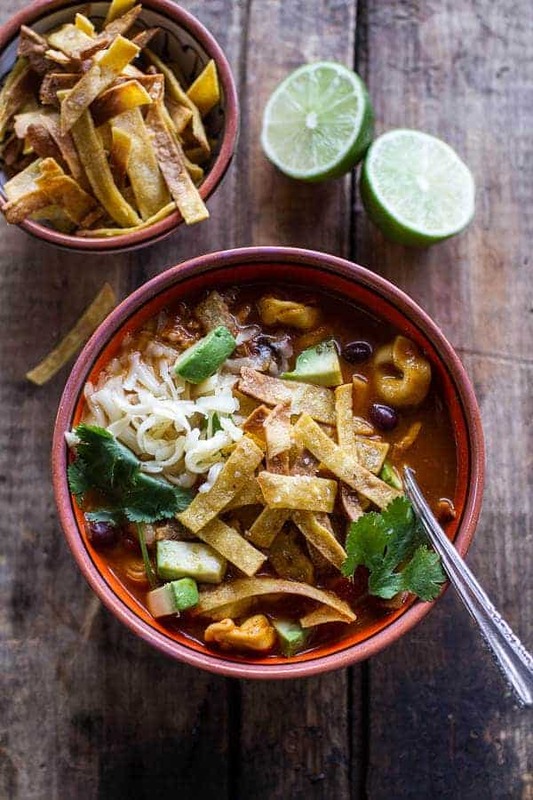 See, it’s not JUST tortilla soup, it has tortellini… and cheese!! Yes, yes, yes. Carbs, carbs, carbs. Cheese, cheese, cheese. Another big fat YES. You see, I married crazy awesome Mexican flavors with Italian tortellini, and while it is nowhere near traditional, it IS awesome. And one-hundred percent weeknight friends over/family friendly/date night ready. So basically it’s perfect for any night – and all occasions. It’s just an all around, gold medal kind of soup. And wow. Do I sound like I am selling something or what?!? Sorry. I am either one of three things. Excited, anxious or incredible tired. Err, actually I am combo of all three things at the moment, but I am not complaining. It’s Wednesday, which basically means Friday is almost here and yeah, that’s pretty good news. OK FOCUS. No more getting off track. Soup! I made this soup the crazy easy way. A lot of you are probably going to tell me this is not tortilla soup at all, but whatever, I am sticking with my name. This recipe is one I actually made years ago before the blog was even a thing. I remember my mom wanting soup for lunch, but all I could find were a few cans of enchilada sauce, so I made soup out of the enchilada sauce, topped it with tortilla strips and called it lunch. The thing is? That ten minute soup turned out to be awesome and I have been wanting to re-create the recipe ever since. Of course, all I can remember about the recipe is that I used enchilada sauce and I called it tortilla soup. Oh well, I came up with another quick and easy recipe that would probably knock that old soup recipe out its cozy winter socks. I mean, there is tortellini and homemade tortilla strips involved here…. So like I said, this soup recipe is SO easy. The bulk of the flavor comes from the enchilada sauce, meaning there are not a whole lot of ingredients. WINNER. 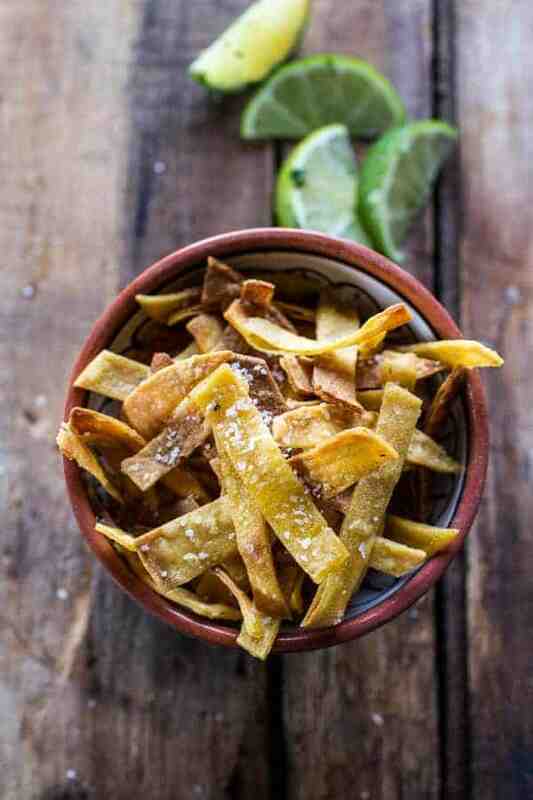 I did make some salty lime tortilla strips that you really have to try. So much better than store-bought and way healthier too!! Oh, and the tortellini? I know, it’s a little weird in a Mexican soup, but I promise it’s the bomb. SO GOOD. To make the tortilla strips, preheat the oven to 375 degrees F. Add the corn tortilla strips to a lightly greased baking sheet. Add the olive oil, lime zest and a good amount of salt. Toss well. Bake for 15-20 minutes, stirring every 10 minutes to ensure even cooking. Heat a large, heavy bottomed soup pot over medium heat. Add the olive oil and once hot, add the onion. Season with salt and pepper. Cook, stirring occasionally until soft, about 10 minutes. Add the garlic and cook another 2 minutes. Slowly pour in the enchilada sauce, chicken broth and tomatoes. Bring the soup to a boil and add the chicken, cover and simmer for 15-20 minutes or until the chicken is cooked through and easily shreddable. Shred the chicken (I find it easiest to remove the chicken and place on a plate, allow it to cool slightly and then shred with your hands or two forks). 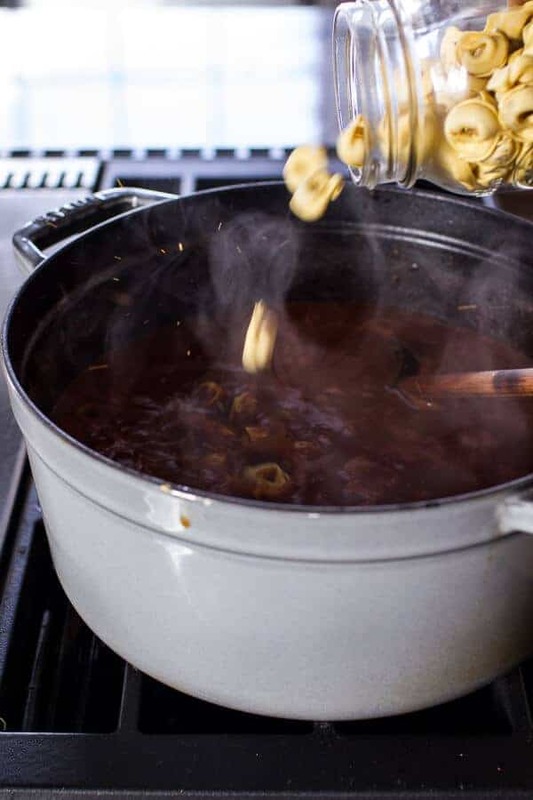 Stir the black beans and cheese tortellini into the pot, cover the pot and cook for about 5 minutes or until the tortellini is al dente. Stir in the cheddar cheese and lime juice. Simmer until the cheese is melted and/or you are ready to serve. 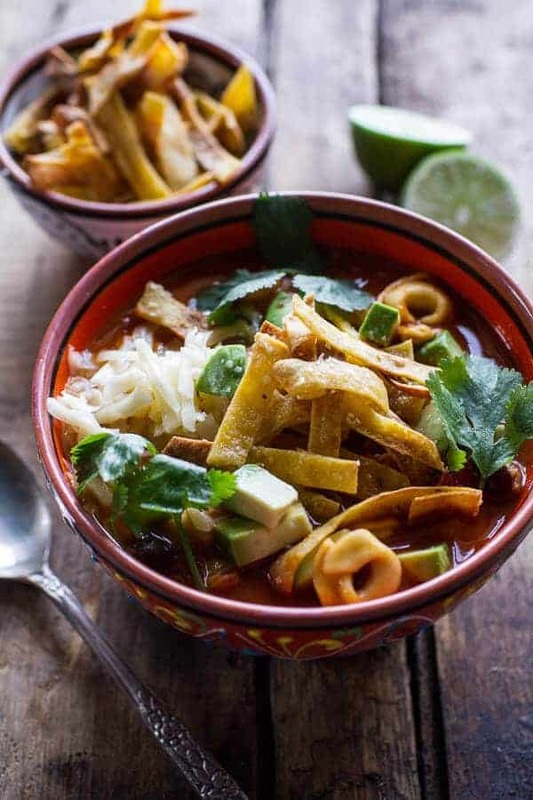 To serve, add a few tortilla strips and a handful of cheese to the soup. Divide the soup among bowls. Top with more tortilla strips, cheese, fresh cilantro and limes. Enjoy! *To make this in the crockpot, add all of the ingredients for the soup, minus the tortellini to the bowl of a crockpot. Cover and cook on low for 6-8 hours or high for 4-6 hours. Shred the chicken and then stir in the tortellini and black beans. Crank the heat up to high, cover and cook for 10 minutes. Serve as directed above. Mmmh! The tortilla chips should make this very interesting… Such a noteworthy recipe! Mmmh! The salty lime tortilla chips should make this very interesting… Thanks for also sharing how to make them because the store bought ones are so mehhh sometimes! Such a noteworthy recipe! This looks so good no matter what you call it. Now I want to know what the other two soups are?? I am in SERIOUS need of this soup. We literally WERE planning a tropical backpack adventure to Thailand. And it just fell through. I needs me some healthy, warm, comfort food and with that cheese and carby goodness? I’m in. Pinned! AWE!! Thank you so much! 🙂 This makes my day. Seriously!! I love the culture-combo you’ve got going on here. This looks amazing, Tieghan! How could you not think soup in this freezing weather?! Although the temps are slightly higher here in Iowa these days. Not complaining! My tween daughter craves Mexican all the time; I’m definitely saving this one for her! I love everything about this soup Tieghan! Quick question tho, if making in the crockpot should the onions and garlic be cooked beforehand? Hey Kathy! No need to pre cook the onions or garlic unless you want them to have a caramelized flavor. I always just throw them into the crockpot without cooking though. Hope you love this! Looks yummy. I love soup on a cold day. I’m pretty sure that soup and bourbon are the only things that get me through the winter. Although, I don’t actually drink bourbon, but bourbon brownies? YES. This looks fabulous! Freezing over here too! So yeah for soup! 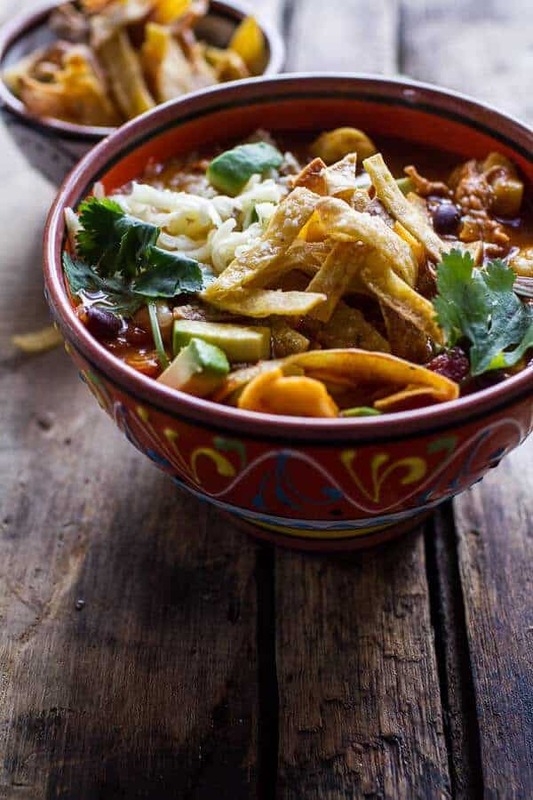 I love me some Mexican inspired soup, so bring it on! And this looks so comforting! Yum! Thanks so much! 🙂 Have a great night! The addition of tortellini is genius!! Totally need to make this soon! 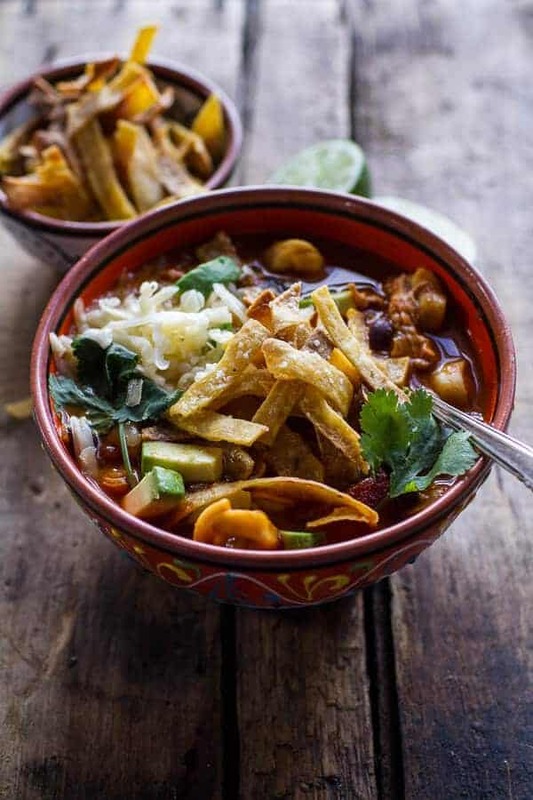 I love how hearty this dish- and LOVE the homemade tortilla strips. It’s so easy to make, I don’t know why more people don’t make it themselves. The store bought stuff is so blah. Thank you so much, Naomi! Hope you are having a good week! Can’t wait to try this yummy soup! You are so talented and so very blessed to be doing something you love! I look forward to your daily emails … it makes my mornings so special! Thank you! 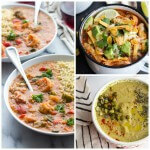 Hope you love this soup and everything else you try! This soup is inspired! I can’t wait to try it. T, Can you tell us about the pottery bowls you are using and where they’d be available? They are a perfect match for this inviting soup. I got that bowl from Crate and Barrel last year. I can’t find it on the site anymore, but maybe it’s in the store? 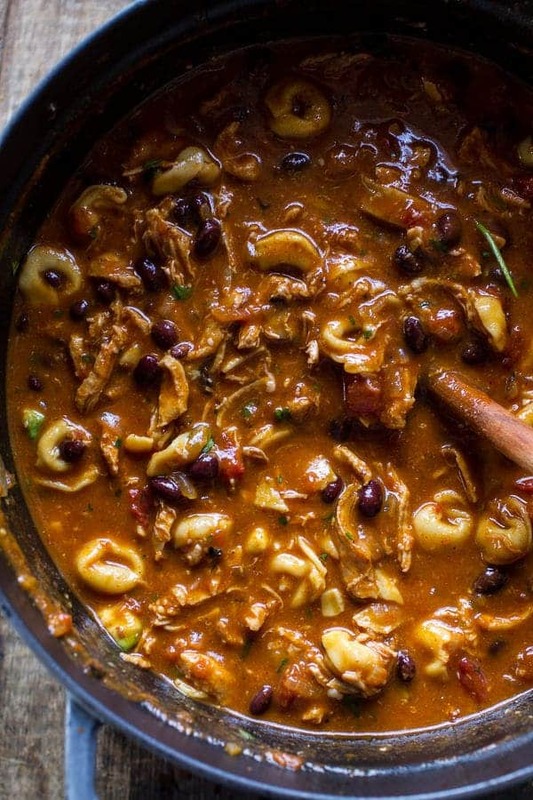 Okay, so enchilada sauce as a quick base for a soup…sounds great…and tortellini adds a lot of bulk (fill you up) goodness…I’m in and pinning! Thank you so much! Hope you had a great day! Oh I will take a cup of this flavorful tortellini soup, or two! Yum! 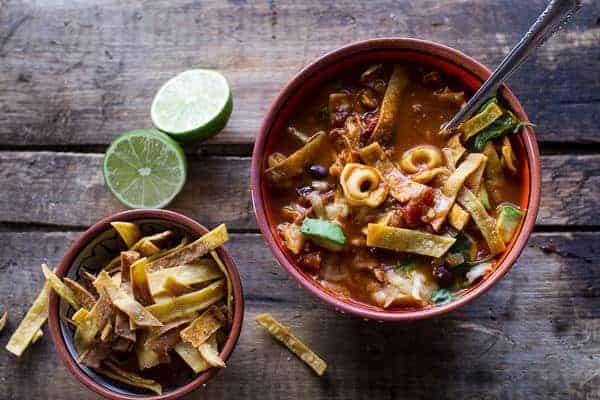 Wow I’ve never thought about adding tortellini to tortilla soup yuuuum!! Awesome pictures, pinned! Obsessed with this. Looks like a must try, thanks!! This soup is amazing, my mouth is watering just looking at it! Thanks so much! Hope you are having a great week! This looks great, our family loves Mexican flavors. 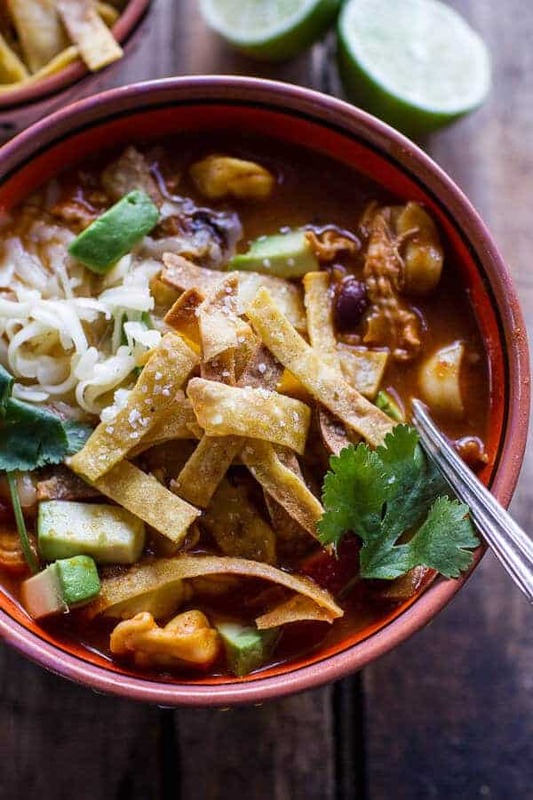 I can’t wait for you to post the rest of your Mexican soups! Thank you so much, Maria!! 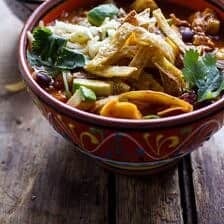 Excited you are excited about more Mexi soups! I love soup. And this one really really is a delicious full meal deal. This soup looks great Tieghan!! 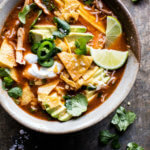 Tortilla soup is one of my favorites, and I love that you added tortellini to it! I’m convinced soup is the ultimate comfort meal, I just love this! 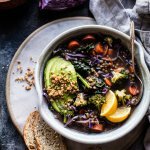 I made this last night and it was amazing [as all your recipes are!] I can’t wait until lunch so I can have it again! I made this soup last week and my husband said it was the best he has ever had and i make A LOT of soups!! I did make my own enchilada sauce from Little Spice Jar and I think that always makes a difference. I love your blog as it is always so interesting and full of flavor! Thank you!! This is so good. Thank you. Just indulging in a bowl. Love it. A Saturday night favorited. Just a quick question for ya: When I “pin” a picture from your site and click on it later to get the recipe, am I supposed to be directed to the page with the recipe on it or just your site in general? Lately I’ve been pinning a lot of recipes (this one included) and I noticed that they just go to the home page… Not that it will deter me from tracking it down to make it!! Just thought I’d ask/ let you know if there is a problem. They should go right to that exact recipe. I will look into the issue. Thanks for letting em know and for all the kind words! This soup is amazing! My wife and I can’t believe how tasty it is! THANKS! So happy you loved it! I am making this soup for our end of fiscal year “soup off”. I have made it twice before and it is fabulous. Can’t wait to win the competition! Aw how fun!! I hope its a hit!! That would be so cool! Let me know how it goes, thanks Ed! Would you need to decrease the liquid if you make the pasta separate? My husband has celiac but my kids are obsessed with tortellini.